I need to do a repair on a table top which involves matching the color of the filler to that of the surface. If you’re a male and — like most males — challenged when it comes to color perception (it’s a physiological reality — men are far more likely to be colorblind and women have far more acute color perception), then having help when trying to select the right color for a fill to do a repair is a huge benefit. Too often I pick a color and by the time I realize it’s not the right one, it’s too late because I’ve already done the burn-in with it. There is help now, and it’s surprisingly affordable. It’s the Color Muse. 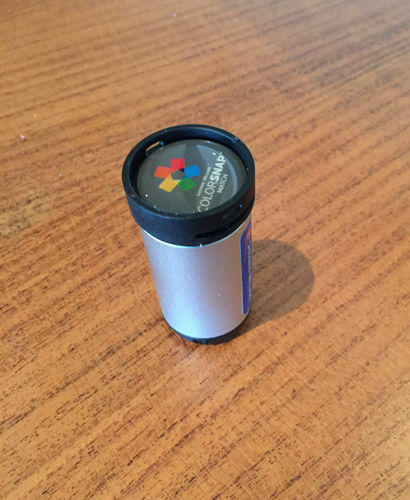 I have the Sherwin Williams branded scanner called ColorSnap, but it’s exactly the same device. In the first photo, I’m using the Color Muse to create a palette of colors for each Mohawk fill stick. These are their E-Z Flow sticks. 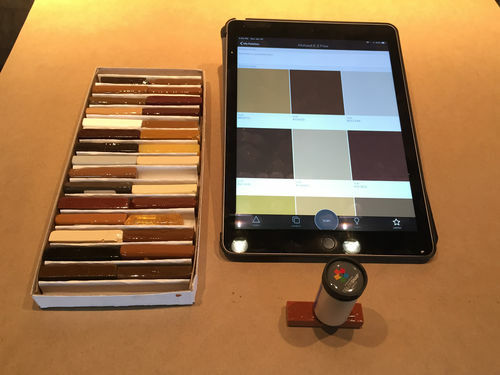 In the next photo you can see the palette colors in the collection on an iPad. I’ve also made palettes for my Mohawk PlaneStick, Hard Fill, Quick Fill and Fil-Stik fillers. In the next photo I’m using the Color Muse to sample the color around an area of the table top that has a gouge and needs repair. By comparing that scan side-by-side with the palette of fill stick colors, I’m able to find a near-perfect match based on the calculated ΔE difference between the colors. You can see in the photo below it’s close but I’ll keep looking to see if I can get closer. In this one, it’s as perfect as it’ll get. And I threw this last one in to show what happens when you’re not even close. Now, I can confidently do my burn-in with that color stick (which takes a lot of practice to perfect on its own). Inteesting, I was just looking at the Color Snap at S-W earlier in the week. I thought it was only useful for matching S-W colors but it seems I was wrong! No, it’s the generic Color Muse, just branded by Sherwin Williams. I downloaded the Color Muse app, and the screen shots look just like the S-W ColorSnap app. 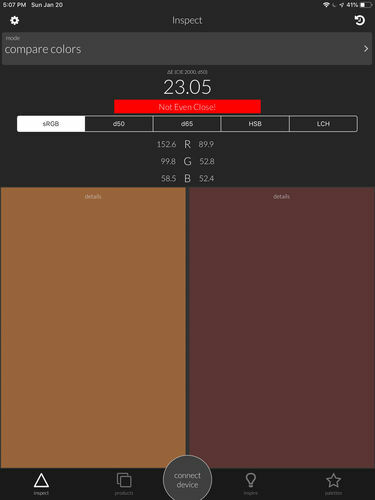 I’m sticking with the Color Muse app, but they’re probably identical. I’ve wasted so much time with grey cards and trying to capture color that this is such a relief. 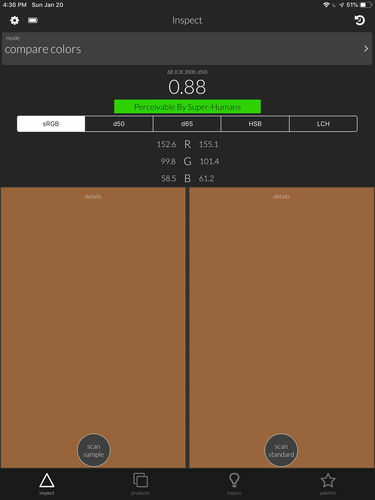 I’m really impressed with the usefulness and the accuracy is adequate for woodworking. 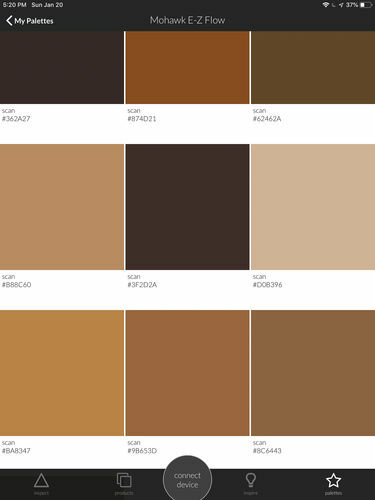 One thing that I do wish is that the app had the ability to find the best match out of a palette for me. This process I blogged about only took about 10 minutes, but hopefully it’s something that they are continuing to improve. I’m working on a job now where the kitchen was only halfway remodeled. The remaining walnut doors and drawer fronts are unfinished and I have to match them to the existing finish. This thing is going to be a godsend, since I am really color-challenged. It’s funny because my wife will look at something and say it’s too red or whatever, and I look at it and think Huh?